At Duchess’s daycare they call them potty words. That is cute. It really is. But as a lover of words, I am hesitant to label a word as good or bad. I am even more hesitant to put them in the potty. Especially since I have spent the last year explaining to Duchess that only poop, pee, and toilet paper go in the potty – not car keys, not toys, and no, not most words. I understand what the daycare is doing. When Michael interrupts a lesson on the difference between the capital A and the lower case a to interject that he thinks applesauce is stupid, the teacher explains that “stupid” is a potty word and moves on. I don’t expect Miss Lindsay to stop class and explain that words are tools, and what you build with them is what matters. Poor Miss Lindsay would spend the rest of the day tumbling down the “why” hole. But it is true. In most cases words are just that, tools. They can be used for good, and they can be used for bad. Take for instance, the word bossy. Sheryl Sandberg, COO of Facebook and author of the best-selling book Lean In, wants to ban the adjective bossy. Why? She feels the word is disproportionately used to discourage females from participation in leadership roles starting at a young age. I understand discouraging a word... but banning it? I think that may be giving the word bossy more credit than it is due. But OK. Fine. Let’s ban using the word bossy as a negative term to imply that any young girl who wants to lead is somehow aggressive, annoying, rude, or micromanaging. While we’re at it, we should probably ban the words aggressive, annoying, rude, and micromanage. See the problem? There are always more words. Again, words are tools. They are the ultimate Lego set. With them you can not only build entire worlds, but you can build the intangible. With the right words, I can craft happiness. Assembled in the right order and with the proper cadence, words can become tears, or anger, or inspiration. They have power, and yes, they can hurt. Banning them is impossible. If the word f-word (the one that rhymes with bag) suddenly disappeared from existence, would discrimination towards LGBT people disappear too? What if we actually banned it, legally, and started arresting anyone that used it? Would that have the desired effect? I don’t imagine it would. Instead, we discourage the use of some words in most contexts through social pressure. We publicly censure (not censor) those who use them – and in my opinion, rightly so. As a lover of words, I acknowledge that they have consequences. Some word carry some pretty heavy historical baggage, like racial slurs, negative references to gender and sexuality, slang for physical and mental disabilities. As a society we aren't happy when people say them, but we don’t take away their right to be stupid and say them anyway. Sorry, stupid is a potty word. So yes. Some words should be discouraged. When used in some contexts, some words hurt. They cause damage by themselves. I have my doubts about the word bossy. I don’t see it carrying the same historical and contextual weight as f-words and n-words and s-words and r-words. Maybe I’m wrong. The participants of history are often blind to their faults. Maybe Ms. Sandberg is way ahead of the game. I’ll readily admit she’s much smarter than I am. Maybe bossy warrants the same social discouragement that those other words do. Maybe we should shame its use in most contexts. But Sheryl Sandberg isn’t saying we should discourage the use of the word bossy within certain contexts. Well, ok, I think that is exactly what she is trying to suggest, but she is using another word that has a lot of power, ban. Sandberg said she hopes the campaign will open a dialogue with parents and teachers, to eliminate the use of the word "bossy," though she concedes this is not really as simple as banning one word. "This is a word that is symbolic of systemic discouragement of girls to lead. We are not just talking about getting rid of a word, even though we want to get rid of a word," she said. "We're talking about getting rid of the negative messages that hold our daughters back." So she does get it. I’m not saying she doesn’t. Sheryl Sandberg is a smart and important person. But the campaign is called #banbossy. It is plastered all over all of their materials. Granted, #discouragethewordbossywithinthecontextofdisouragingyoungwomenfromleadershiproles is really long and cumbersome. It practically takes up an entire tweet. 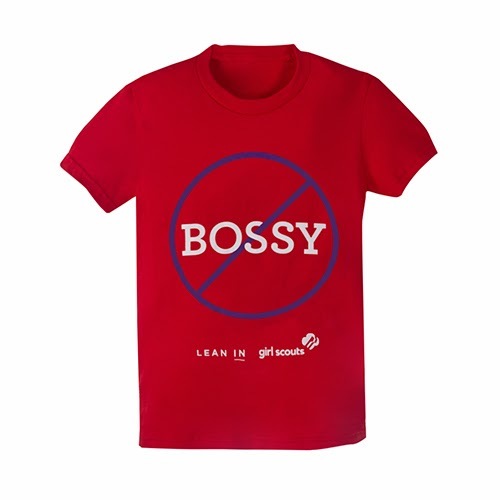 I know we live in a world of sound bites and retweets, but while #leanin worked as a catchy slogan that started a much larger, and needed, conversation about women, I fear that #banbossy is just going to lead to more posts and discussions like this one. People are going to shut down, and no one is going to read the really good, sound, and useful advice that is on the website. In that way, the campaign is a victim of the problem it is trying to point out. Words are there to communicate intent. Girls, intentionally or unintentionally are being discouraged from developing leadership skills that will give them strong footing in a world that needs more leaders. On its face, the campaign “Ban Bossy” is failing to communicate that. It is too focused on the word. It is probably too late to rebrand. All the printed materials are made, the campaign is launched, media buys are bought. It would be too expensive. Still, as the campaign moves forward, I hope that Ms. Sandberg chooses to focus less on the negative power of one word, and more on the positive power of my daughter and every other girl in the world. Instead of trying to get teachers to not call my daughter bossy, I would like to focus on getting teachers to call on my daughter, period. All of that said, I still encourage you to take a few minutes and visit banbossy.com. My qualms with the campaign’s name aside, there is a lot of good advice for raising/teaching women and closing the confidence gap. It would be a shame if you missed out on it because of my rant about the words. You can come offer your feedback on Facebook too. Words can't be banned, but context can and should be defined. If a person or a group is offended by a word/slur/descriptor/phrase (they're all just words though, we haven't yet devolved to grunts and gestures), then they (the offended) should do what they can to educate others about why the context in which it was said was offensive. And those that said it (the offenders) should LISTEN and adapt. It may ultimately prove that the offending word in such context becomes phased out as a result, having no legs to stand on outside of that offensive context. But if it doesn't, well then it would go to show that the fact that it remains means that the word holds meaning beyond just that which has been identified by those who were offended. Blah blah blah words. People need to get a damn life. If you ban the word "bossy", what is next? Worry about stuff that matters, rather than what words someone, or some group are using. How about we worry about raising kids that are self sufficient, and are able to fend for themselves? How about we worry about raising kids who, when they get called bossy, can defend their position in a competent manner rather than just cop out with "I'm offended" or "that's not fair"? How about we worry about raising children who can think for themselves and get themselves out of a bad situation rather than depending on someone else to do it for them. Were there "bossy" kids in 1960? How did they work it out? Did they try and ban the word? Shouldn't we be focusing on more important issues in the world than the affect of one word that in my opinion is not a bad word. I feel the word is used when people aren't getting their way and feel a need to act out and the easiest way is to call a woman bossy. If I get called bossy then I know that I'm just hitting a nerve trying to get something I feel passionate about done. What an excellent and well-thought-through post. I totally agree, both with your assessment of the power of words and the total ineffectualness of banning them. I'm wondering: how do you teach your kids not to use words in certain context without falling into the "potty-word" trap? I loved "tumbling down the why-hole"! So true. But perhaps while teachers need to have these catch phrases to make sure they can move on and teach their lesson, it is our job as parents to sit down and lay out the whole situation for our kids in detail. I've been trying to explain to my son that it is not kind to say his sister is a "naughty girl" when she is spilling juice, and that although they both sometimes do things that are not great, we love them unconditionally and they are our beloved children, whatever they do. But I do worry that the subtleties of the distinction between character and behaviour are lost on him, and that I confuse him if I then say pushing your sister over is naughty half an hour later. Do you always explain these things to the Duchess in detail, and just hope that slowly her capacity for abstract reasoning will catch up and your words of wisdom will start to click into place? As George Carlin so aptly said: "There are no bad words, there are bad thoughts, bad intentions, and words. But you put a word with a thought and BAM! You're stuck with it." On the F-word that rhymes with bag, remember that in other English speaking cultures (England) that word means cigarette. The first time an English visitor asked me for a smoke using that term, I had to explain what it meant in the US, and we had a lively discussion about how different words mean different things in England. Their term for a gay man is pouf, for instance. My father used to use the word with the "gots" ending to mean a bundle of twigs used to start a fire, which is an older US word which is not used much today. This post reminds me of something that I said when I was a kid. My mom overheard me saying "dammit!" When she explained that was a "bad" word, abd kids dont use those words- I responded with "what are kids supposed to say when they're pissed off?" Makes it kind of hard for me to decide what to do with my 2yr old and his sailor toungue. He uses the F word (rhymes with duck not bag) in regular conversation with his toy wrestlers. I find myself quite embarrassed if anyone else is near to hear- but can't quite justify telling my kid that a word is some how Bad. I'm a preschool teacher and I will never use the word bossy, however, I won't allow children to play or solve social problems using bossy behavior, whether they are male or female. Being bossy isn't the same as being a leader. No one likes to be bossed, and pretty soon, bossy children have no followers. Children who are bossy are taught better ways to interact with peers and solve social problems, thus creating confident leaders instead of insecure bosses. I dislike the campaign because it doesn't recognize the difference. I agree. I'm a woman. I was a manager. I've never been called bossy to my recollection. I never was bossy. Bossy is bad, not as a word as a trait. To me, bossy is someone telling someone what to do either without authority or without acknowledgment or respect for the person they are speaking to - it's treating them like they are kindergartners when they're adults, it's acting as though they are stupid and don't know how to do their job. It's certainly not a good management skill. If they want to stop acting like women who are assertive are somehow less feminine, that would be good. But being bossy is not being a leader. I didn't have to "boss" my employees around. I had a high functioning team becuase I valued their input, I got their buyin, and I used my sales skills to guide them to where we needed to be as a team. They felt we were a team. Sometimes they had great ideas that helped our production, sometimes their ideas didn't work. But I treated them all with respect and as though they would someday be a manager and need to know how to think about the bigger picture. That's leadership. Not just constantly telling someone what to do in a rude manner. Bossy should be banned - but not the word, what it describes should be banned. And I think everyone in this campaign is doing women a disservice when they act like we only know how to be bossy. I'm not bossy, never have been. But I've been a leader in many areas of my life. The two don't connect. Let's focus on the goal and maybe teach our children why being bossy doesn't help you get ahead in life instead of saying you can't use that word. Dawnmarie, you nailed it! I have had bossy managers (both male and female) and their results were generally awful. And I have had leaders as managers, again both genders. What a world of difference. As soon as someone resorts to the "because I said so" model of management, it's bossiness, not leadership. Why in the world are we fighting to "own" the right to be bad leaders? Ahh what ever happened to good ol free America. What happened to freedom of speech. These days if it offends somebody then it's sooooo bad and the govt steps in and takes another chunk of freedom away. Grow up it's a word if it hurts you leave the area or better yet, go face plant off a building.